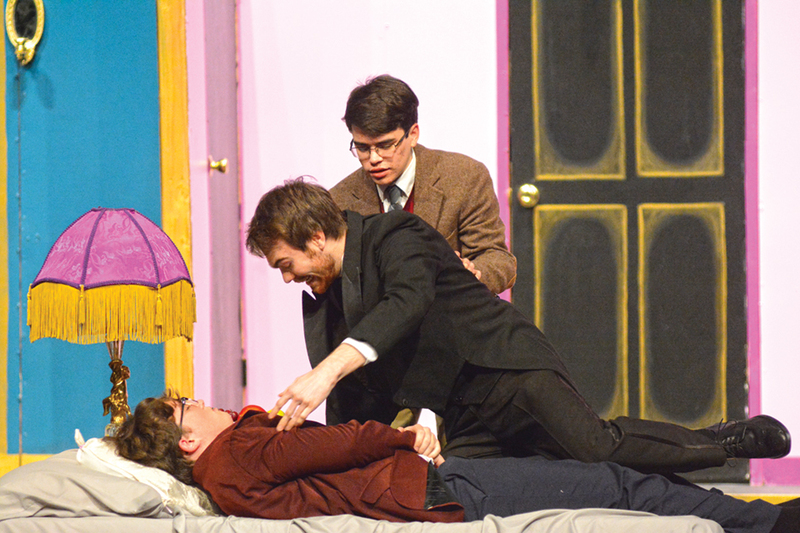 McNary’s drama department is performing Lend Me a Tenor on Friday, March 2 at 7 p.m. and Saturday, March 3 at 2 p.m. and 7 p.m. in the Ken Collins Theater. General admission tickets, available at the door or in advance at mcnary-theatre.ticketleap.com, are $5 for students and seniors and $7 for adults. Lend Me a Tenor, a comedy written by Ken Ludwig, received nine Tony Award nominations when it premiered on Broadway in 1989. The play, which takes place in 1934 in a hotel suite in Cleveland, Ohio, stars McNary students Jon Taylor as Max, Matthew Albright as Saunders, Steven Cummings as Tito, Sydnie Gould as Maria, Bella Fox as Diani, AB Feinauer as Julia, Rachel Herries as the bellhop and Elise Myers as Maggie. Saunders, the general manager of the Cleveland Grand Opera Company played by Matthew Albright, and Max try to wake up Tito after the opera singer has taken a double dose of tranquilizers.